Another Monday, but another memorable weekend for the books. Friday morning, we headed to Toys R Us. 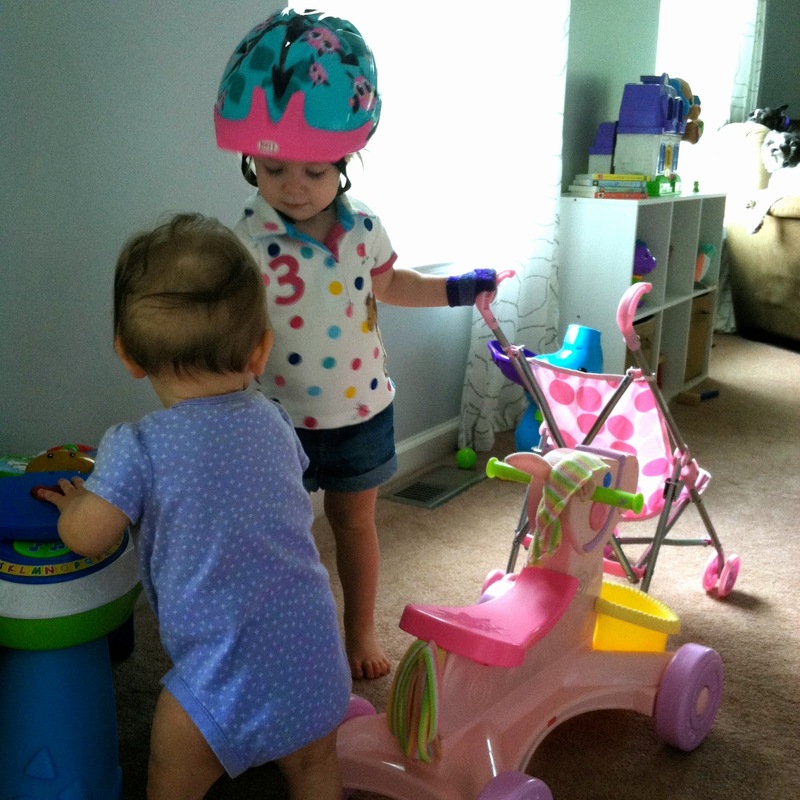 I had a return to make and went with the mission of getting Ashlynn a helmet. She's become quite the daredevil riding her (powerless) four wheeler down our somewhat steep driveway into her daddy's arms. She was pretty impressed it with it. Saturday started with breakfast and beasting a bunch of weekly cleaning. After I snuck out at Kenley's morning nap to get Starbucks and a pedicure. I think the last time I was got one was prepping for the wedding I was in back in November a few weeks before Kenley was due. When I got back, A was happily having a snack with her dad and Kenley still sleeping. After naps we headed to the mall. My denim shorts are pretty much falling apart, which isn't surprising since they pre-date Ashlynn and lasted two pregnancies. We swung in AE (since that's what my last pair was, which I clearly have worn to denim death) and the shorts were 60% off - $14.99. I know J.Crew is having great in store sales too, if anyone is looking for some last minute summer goods at really low prices. After we headed to Build-A-Bear. We've never taken Ashlynn before and I promised her a trip to the Teddy Bear store. Naturally, she picked the bunny over the bear. She's always a bit (a lot) shy, so she didn't get really into the rubbing and jumping to "start the heart", but she was having a blast and I think I jumped enough for her. She loved giving New Bunny, his name, a bath and brushing his ears after. Pretty sure, that made her whole day, but we weren't done. We stopped out for dinner at Zoe's Kitchen, one of our favorites because it's quick, cheap, and delicious - and Ashlynn always eats her quesadilla. So then we went for ice cream. Solid toddler day in the books. Sunday started too early with both kids getting up before they should so we headed to Panera for bagels. We hit Wegmans to do our shopping for the week after and were home before 9am. Kenley took a nap, Mommy Ashlynn played with sidewalk chalk and after lunch we hit the pool. There was also quite a bit of golf watching mixed in there, but isn't there always? And we've(I've) been Rickie Fowler fans for years. I started Ashlynn on the bandwagon last year too! I tried giving Kenley a bath with a laundry basket, but it wasn't much better. She did sit a bit more, more I still had to get into the tub to hold her since she was standing a lot. Hopefully she just learns to sit at some point, I'll try to keep with it and see if it gets better. In other news, I think she might be getting another tooth, standing on her own for a split second before squatting down, and she's slowly starting to walk with her walker. Full out saying Mama and finally getting some "da da" sounds, just hasn't used them with purpose yet. Sounds like a fun weekend! We might need to hit up build-a-bear soon! Fun weekend! Ashlynn's face is too cute with her new bunny! Aw,man - too bad the magic laundry basket didn't work for you. I had high hopes! I am having similar issues with Ellie standing in the tub. She loves bath time so I just keep telling her to sit down and then manually make her. If she keeps doing it I just tell her "okay bath time is over" not sure if she gets the cause and effect yet but I'm sure she is sad that she has to get out of the bath. I stopped into build a bear a couple of weeks ago and can't wait to take Ellie to get one of the my little ponies!! aw sounds like a great weekend! I love the pic of her riding down the driveway! haha me too, although I was waiting for thr internet to explode at how dangerous it looked or something. But at least she has a helmet now! I'm going to try a few more times to see if she gets used to it. Still better than her flipping all over the tub, and definitely the only way I could do it solo... she's insane! definitely does, everything is bunnies around here! Yeah, Ashlynn would do it too at Ellie's age, but she was sturdy and able to stand and also understood "no" and "sit" hahaha, Kenley not so much lol. We use a laundry basket for baths currently, and it was a great transition from the sink. I think it's getting too small now, but we used it pretty much from 7-8 months to now (20 months). Hope it works out better for you next time!